What sets the College of Charleston MBA apart? Its outstanding return on investment. Our one-year, low-cost (in- or out-of-state, same tuition) MBA will help you advance your career and make your mark in business — and beyond. Submit your application to the College of Charleston MBA program — named #1 in the country for job placement. Hurry, apply before May 1, 2019. Picture yourself having coffee with the former CEO of a major fashion company or a VP at a Big Four accounting firm. For our MBA students that daydream is a reality. Each student is paired with their own executive mentor. Our MBA program has an unparalleled relationship with local business leaders who offer their expertise not only as mentors and lecturers but as employers, often providing students with career and internship opportunities. We pride ourselves on the intimate nature of the MBA program. The cohort is small by design, providing students with the best environment to forge lifelong professional connections and friendships. What better way to gauge the ROI of an MBA program than its students’ success in the employment marketplace? U.S. News & World Report Best Grad Schools 2019 Edition recognized the College of Charleston’s MBA job placement rate as #1 in the country. An impressive 100% of our job-seeking MBA graduates were employed three months after earning their degree. You’re next. Pursue the #1 MBA for job placement. 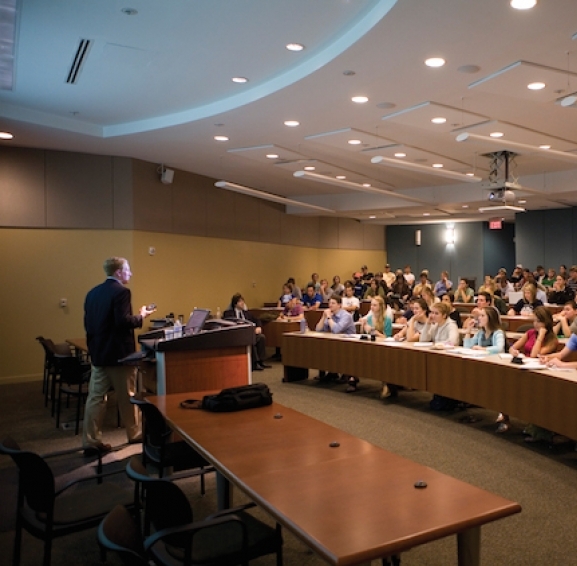 The College of Charleston has designed a program that instills more than just business knowledge; it also equips you with soft skills often overlooked by other MBA programs — we’re talking public speaking, leadership, self-awareness, teamwork and much more. You’ll also be matched with an executive mentor who will pass on years of experience — and valuable connections — to aid you in your career development. And, you will work one-on-one with a professional coach to help you clarify your future ambitions, assess your strengths and weaknesses and create a personalized action plan to improve your professional capabilities in ways that matter most. We call this approach the Charleston Way. And it works. Just like our graduates. Gain a superior business education in just one year. Sure, Charleston has palmetto trees, great food and sandy beaches. But what really gives the city an edge is the number of current and former C-level executives who call Charleston home. Not to mention, the region is booming economically with Fortune 500 companies playing a major role in driving its vibrant and diverse business community. This dynamism is a big reason our graduates find jobs. Find yourself in the city of opportunity. While our MBA curriculum is developed to provide students with a well-rounded business education, you’ll also have the opportunity to choose one of three focus areas for your elective courses. This allows you to hone industry-specific skills that align with your career goals.